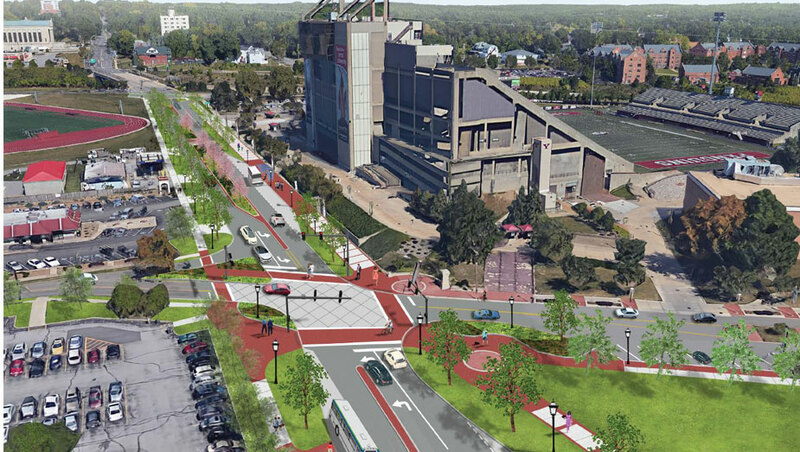 YOUNGSTOWN, Ohio – Ground could be broken as early as next fall on the first phase of a $22 million transportation infrastructure project that will renovate downtown Youngstown and the Fifth Avenue corridor. The improvements are being funded in part by a $10.85 million grant from the U.S. Department of Transportation’s Better Utilizing Investments to Leverage Development, or Build, program. The award was announced Thursday. Jim Kinnick, executive director of Eastgate Regional Council of Governments, said the Smart 2 Network – the acronym that stands for Strategic & Sustainable, Medical & Manufacturing, Academic & Arts, Residential & Recreational, Technology & Training – will put Fifth Avenue on a “road diet,” reducing it to three lanes with a boulevard down the middle, down from the five and sometimes six lanes it currently has. Eastgate was one of the local partners in the grant application. The project will also include upgrades to Commerce, Federal, Front and Phelps streets and Park Avenue, adding transit waiting stations, pedestrian and bicycle facilities and implementing autonomous shuttles serving downtown, Youngstown State University, St. Elizabeth Youngstown Hospital and the Joseph Co. International manufacturing and research complex on the East Side. “It’s going to be aggressive, but I’m trying to shoot for a three-year window here,” with a groundbreaking every six to eight months for phases of the project, Kinnick said. A rendering of potential upgrades to Fifth Avenue as part of the Build grant. Local partners in the project, which include Youngstown State University, the city of Youngstown, the Western Reserve Transit Authority and Mercy Health-Youngstown, raised nearly $11 million in in-kind matches for the grant, Kinnick added. The group had twice before unsuccessfully sought grant funds from the Department of Transportation’s Tiger – or Transportation Infrastructure Generating Economic Recovery – program, the predecessor to Build. Eastgate, the regional transportation planning agency, submitted the revised application this summer. “The resiliency of this group to continue to improve our application and work to make it a better product is paying dividends today,” Kinnick said during a quickly assembled news conference Thursday afternoon to discuss the grant award. The project “capitalizes on the synergy in the urban core right here in the city of Youngstown and expands it with the connectivity to the entire region,” he added. Kinnick praised U.S. Sens. Sherrod Brown, D-Ohio, and Rob Portman, R-Ohio, and U.S. Reps. Tim Ryan, D-13 Ohio, and Bill Johnson, R-6 Ohio, for their efforts on behalf of the local application. The lobbying effort to secure approval of the grant involved several trips to Washington, D.C., Ryan said, including a trip this summer led by the Youngstown/Warren Regional Chamber. “We’re a resilient crowd and it’s good to see a win come,” said James Dignan, president and CEO of the Regional Chamber. The grant will “keep the momentum going that we’ve got going in downtown Youngstown,” he added. Tressel also took the opportunity to “put the heat” on the city’s deputy director of public works, Chuck Shasho, to accelerate work on the project. “Some of us are getting older and we need to see things sooner,” he said. In separate news releases, both Brown and Portman praised the grant award. Youngstown Mayor Jamael Tito Brown, who was in Columbus Thursday, hailed the grant and the collaborative effort. Pictured: Jim Kinnick, executive director of Eastgate Regional Council of Governments, is joined by application partners to announce the $10.85 million grant award.